“Pockets Change” is a new non-profit partner of California Jump$tart Coalition. We are delighted to welcome Andrea Ferraro as a new member of our Board! The Center For Financial Empowerment, a non-profit associated with SCE Federal Credit Union, is a non-profit partner of California Jump$tart Coalition. We are delighted to welcome Abby Ulm as a new member of our Board! 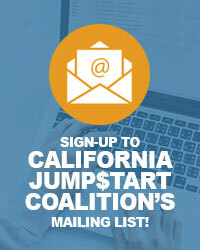 EverFi Financial Literacy is a valued partner of California Jump$tart Coalition. We are delighted to welcome Hayley McKane as a new member of our Board! Money management is the one subject that everyone will use "in real life," but not all schools offer effective financial education. Does yours? Visit California Resources, our comprehensive list of California-specific financial education programs. Visit Jump$tart Coalition, our national coalition dedicated to improving financial literacy in our youth. Visit Jump$tart Clearinghouse, a repository of personal finance materials for educational use. The California Jumpstart Coalition is a not-for-profit, volunteer-driven group with hundreds of organizations and individuals representing businesses, government agencies, non-profits and education across the state. Affiliated with the National Jump$tart Coalition for Personal Financial Literacy, we have joined together to improve the personal financial education of California's youth. California Jump$tart will provide a no cost, six session workshop, on the topic of Personal Financial Literacy for teachers, K-12, in your school district or county.